1. Shine, The Reloader, Upcoming Promotions And $1,000 New Depositor Tournament At SunPoker (07/09/2010) SunPoker's Shine On September 1, 2010, the SunPoker VIP Club loyalty program got a new name and a BIG 200% cash rewards boost. The debut of �Shine,� the enhanced SunPoker loyalty program, brings with it not only a sleek new name, but also raises cash rewards over 200% for rake play at all VIP levels. Cash is king and cash game players rule the poker tables at SunPoker. By offering cash game players..
2. Win Five 2010 WSOP Prize Packages Online At SunPoker From 24c (17/04/2010) SunPoker is offering online players 5 prize packages that will send them to Las Vegas to play in the 2010 World Series of Poker. WSOP Satellites start for as little as $.24 cents. Full Details are below and on the special WSOP page on..
3. $250K Double Up Tournament, $1 Million Guaranteed And Cash Races At Sun Poker Room (03/02/2010) $250K Double Up Tournaments Throughout the month of February you can double up to your share of $250,000 in SunPoker's Double Up Tournament Race. If you love tournaments, you'll love the Double Up's. SunPoker Double Up..
4. New SunPoker Software 9.3, Casino Games, $1 Million Guaranteed, 2 Billionth Hand And Other Promotions (08/12/2009) SunPoker is proud to announce the release of its new poker software version 9.3. In addition to an enhanced lobby, highlights include: quick seat features, enhanced game listings, new menu design, new text colors, and GBP and Euro..
5. SunPoker Now Offers Moneybookers For Players; Get Extra $50 Bonus On Sign-Up (06/08/2008) SunPoker now have Moneybookers as a deposit and withdrawal option. This will help immensely with new joins especially from Europe as many players have been waiting for Sunpoker to get Moneybookers as a payment option. The poker..
6. Exclusive SunPoker's Freeroll Tournaments This Friday (29/05/2008) We would like to present exclusive freeroll tournament to be held on Friday at Sun Poker: Name: SunPokerAffiliateFR Date: May 30, 2008 Time: 18:00 GMT Will be listed in the software: 72 hours prior Registration: 24 hours..
7. Sun Poker Room Releases GBP Cashier For UK Players To Save Their Money (09/04/2008) Starting April 3, 2008, SunPoker has made it easier for online players from the UK and all of Europe to play at their online poker tables. The long awaited British Pound (£) cashier is now available to SunPoker's players..
8. Improving Your Poker Game Before Blaiming 'Bad Beats' - Sun Poker Blog (27/01/2008) A lot of players claim that they have gotten bad beats all the time, or that they can never win. Instead of doing the logical thing and looking at your game and comparing your results with others and seeing what they can do to..
9. $300,000 WSOP Mega Freeroll And $1,000 Monthly Bonus At SunPoker (19/01/2008) SunPoker is putting up 25 WSOP (Main Event) packages so players can earn a seat at the grand daddy of them all. The best part, players can earn a $12K package for as little as 10 MPPs (my poker points). Each week, online poker..
11. Caribbean Poker Classic 2007, Rake Race For Poker Players At SunPoker (12/09/2007) The 4th annual Caribbean Poker Classic (CPC) begins this November and as usual SunPoker is shoving all-in with promotions to assemble the largest Team in CPC History. Starting August 1st through October 31st SunPoker is giving away..
12. $400,000 2007 Caribbean Poker Classic Freerolls And New Players Freerolls At Sun Poker (18/06/2007) $400,000 2007 Caribbean Poker Classic Freerolls Online players have good chances to join Team SunPoker in November for the third annual Caribbean Poker Classic tournament in St. Kitts! From May 19th through November 8th SunPoker..
13. Golden Cup Series of Poker and Caribbean Poker Classic Freerolls at SunPoker (04/06/2007) Go for the Gold in June! The £500K GOLDEN CUP SERIES OF POKER (GCSOP) is a one-week event consisting of seven separate poker tournaments, beginning on Monday, June 4th and running through to Sunday, June 10th. The GCSOP offers..
14. March Sun Poker Promotions - Freerolls, One Sick Promo, Monte Carlo Millions Seats And New Bonus Code (12/03/2007) This month SunPoker is offering incredible value for new players - welcome bonus, multiple guaranteed tournaments and satellites, and free-rolls! $10,000 Monthly New Player Freerolls Every month SunPoker will award new..
15. Seats To The 2007 WSOP Guaranteed - Win Up To $100,000 In One Sick Promo (15/02/2007) One Sick Promo is rolling into its third month with new online poker players still making the list within 30 days. SunPoker cardroom reported some players had already accumulated 50K+ MPPs in a single month. It's the best WSOP..
16. Freerolls And Other Monthly tournaments At SunPoker In February (04/02/2007) $10,000 Monthly New Player Freerolls Every month SunPoker will award new players with a ticket to a $10,000 monthly freeroll tournament. All they have to do is earn 100 MPPs (my poker points) within 30 days of registering their..
17. $25K Monthly And $6K Weekly Freeroll Tournaments And EPT Qualifiers At Sun Poker (17/01/2007) Starting January and every month after, Sun Poker will be hosting a Mega $25,000 MPP (my poker point) freeroll tournament for its loyal players. Buy-in directly or qualify daily for a little as 100 MPPs. $25,000 Monthly MPP..
18. Final Table Results Of Caribbean Poker Classic 2006 (05/12/2006) $6000+ $300 No Limit Hold'em Main Event's Final Table, December 2nd. Final Table Players and chips: Pete Willy 702,500 Frederik Lofgren 259,500 Martin Wiklund 460,500 Rakesh Gupta 254,000 Ryan Boon 252,000 Fredrik Haugen..
19. 2006 Caribbean Poker Classic Tournament: Third Day Results, Hold'em Blackjack Invitational (28/11/2006) $300+ $30 No Limit Hold�em, November 26th, 2:00pm Entries: 96 Prize pool: $27,940 The third day of the 2006 Caribbean Poker Classic starts with a $300+30 no-limit hold'em freeze-out, with 96 entrants. Among the participants..
20. 2006 Caribbean Poker Classic Tournament: First Day Results Of November 25th (27/11/2006) The following 3 events has been held during last two days and we provide here results and comments: ------------------------------------------------------ 1) $200+ $20 Super Satellite, November 24th, 10:00pm Entries: 62 Rebuys:..
21. New Hold'em Blackjack Game At Sun Poker - See Complete Rules. Where Blackjack Meets Texas Hold'em (20/11/2006) Sun Poker card room has announced the addition of new Hold'em Blackjack to its poker lobby. Hold'em BlackJack is a revolutionary new game that combines the peer-to-peer challenge of Texas Hold'em poker, with the exciting game of..
22. Win Your Seat At The 2006 Caribbean Poker Classic At Sun Poker Card Room - Play Qualifiers And Penny Satellites (12/11/2006) Imagine all the excitement of first-class poker combined with the beauty, charm and elegance of the Caribbean, complete with endless beaches, emerald green hills and a majestic volcano. Add a tropical rainforest with resident Vervet..
23. EPT Season 3 Schedule And Qualifiers At Sun Poker Room (24/10/2006) Sun Poker card room is proud to be hosting online qualifiers to season three of the European Poker Tour (EPT). A €6,600 prize package that gets you into the largest and hottest poker tour in Europe. Qualifiers start for as..
24. Stakes Raised To Help Veterans - Wounded Warrior Project (24/09/2006) Professional poker players are all about the raise, but Kenna James had never seen one so poignant. An 8-year-old boy, watching a veteran who lost both legs during a rocket grenade attack in Iraq, pledged his allowance for the year..
25. New Bonus Structure And New Site For Sun Poker Room (12/07/2006) The new bonus effective July 1st, 2006 for Sun Poker players will be $150 eligible: A. Match Bonus - 100% match up to $50 released after 250 MPPs. B. Reload Bonus - $100 reload after 500 MPPs with $100 deposit (must..
26. Sun Poker And Bluff Magazine Are Hosting A WSOP 'Dream Shot' Free Roll Texas Hold'em Poker Tournament Giving 2 Wounded Warriors Seats To The 2006 WSOP (08/06/2006) �Cowboy� Kenna James is saddling up for a ride into San Antonio Texas on June 20th and 21st to run the "Dream Shot" Tournament that will end with two Wounded Warriors winning seats to the 2006 World Series of Poker at the Rio Hotel &..
27. Detroit Native Wins Seat At Upcoming World Series Of Poker Playing At SunPoker (06/06/2006) (Wauburn Hills, MI) - Sun Poker was looking for the best Texas Hold 'Em poker player in Michigan to represent "Sun" in the greatest poker event - 2006 World Series of Poker (WSOP) in Las Vegas. Claude Mason, 35, from Taylor, Michigan..
28. 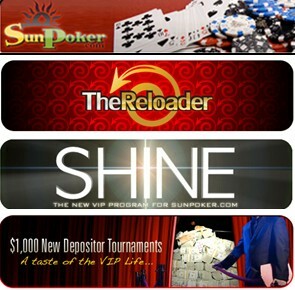 $4 Million In Tournaments Every Month At Sun Poker. Play In $600K Guaranteed Six Pak Tournament (21/05/2006) How many poker rooms do you know that offers $4 Million in Guaranteed Tournaments... every month? Can't think of one? We're not surprised! Sun Poker takes pride in offering the biggest and the best in the world. Check out the current..
29. WSOP 2006 Qualifiers And Second Chance $200K Freeroll At Sun Poker (17/05/2006) The Sun Poker WSOP 2006 qualifiers are here and players can win a $15K package for as little as 200 MPPs (my poker points). Sun Poker players can qualify online and win on of the $15,000 packages to the 2006 WSOP. The prize package..
30. SunPoker Signs Poker Superstar Kenna James (12/05/2006) Sun Poker is proud to announce the signing of poker superstar Kenna James to become the face and spokesperson of the brand. Kenna will serve as the captain of "Team SunPoker", and as such will be on a mission to teach every player..
31. XMAS CRACKER - 150,000 British Pounds Tournament At Caribbean Sun Poker (12/12/2005) Caribbean Sun Poker room holds special XMAS Cracher tournament with Guaranteed £150k Prize Pool. What�s the best way to cover those XMAS Debts? By Winning an online poker tournament of course... and make it a Big Juicy One. So -..
32. There's Nothing Like A Cold Sixpack! Play Aggressive Poker In New Caribbean Sun Tournaments On Saturdays (10/12/2005) What is a SixPak? Caribbean Sun Poker is now giving away free sixpacks of beer to players who deposit. Just Kidding!.. Caribbean Sun Poker now hosts Saturday SixPak tournaments. There's Nothing like a SIXPAK during Happy Hour! What is..
33. Caribbean Sun Online Poker Room Offers Up To $90 Free For All New Players (05/09/2005) $50 Free For All New Players: Receive a 100% match deposit bonus up to $50 on your first deposit in Caribbean Sun Poker (or simply Sun Poker) card room. The money will instantly appear in your ECash account upon making the qualifying..
34. Royal Flush Bonus And Daily High Hand Promotions At Caribbean Sun Poker Room (11/07/2005) ROYAL FLUSH BONUSCaribbean Sun Poker offers a promotion to all players $500 / £300 that receive a royal flush during real money play. In order to qualify, the player must: Be playing real money games (excluding tournaments). Use..
36. Caribbean Sun Poker $100K Guaranteed Tournament, Free Rolls and WSOP Satellites (15/05/2005) $100,000 Guaranteed Tournament at Caribbean Sun PokerA lot of things in life aren't guaranteed but on May 29th a hundred thousand bucks is! Players can buy their way directly into the $100K Guranteed Tournament or earn their way in..
37. Caribbean Poker Classic tournament at SunPoker room (08/09/2004) Caribbean Sun Poker Room presents the Caribbean Poker Classic televised Championship Event in St. Maarten, with an estimated prize pool of $1,000,000. The No Limit Texas Hold'Em event will be held December 5-11, 2004. Imagine..
38. Caribbean Sun Poker Room Action Heats Up With New Games, Smaller Tables And New Player Incentives (02/06/2003) (Willemstad, Curacao) - In its continuing effort to provide players with the most authentic, pure online poker experience, the Caribbean Sun Poker Room today becomes one of the first online poker rooms to offer card players real-time..